Guill Tool, a global manufacturer of extrusion tooling, has released its new reciprocating head. The traditional tip and die assembly is replaced with a linear reciprocating assembly that changes the tube’s profile within a given length. This process is repeated throughout a single extrusion run without interruptions. Cutting capability, in association with the extrusion speed, cuts the finished product to length. While cost and value stream activities are reduced, quality is improved. Only one extrusion run is needed to produce a finished product, as opposed to multiple extrusion runs with tooling changes along with a manual assembly operation to connect different tubing shapes. Guill’s new reciprocating head eliminates an assembly operation. It also eliminates in-process inventory. 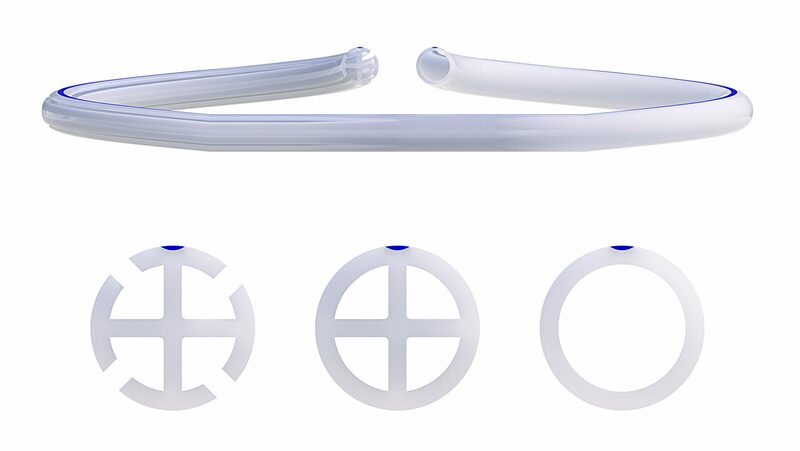 Thus, there is no need for storage of various tubing shapes and connectors needed for assembly, fulfillment of orders and replenishment of finished goods. Furthermore, the reciprocating head eliminates a connecting piece, allows JIT production and products made-to-order. Lastly, it reduces total run time from receiving the order to shipping. Walter Advance taps provide excellent reliability and performance.